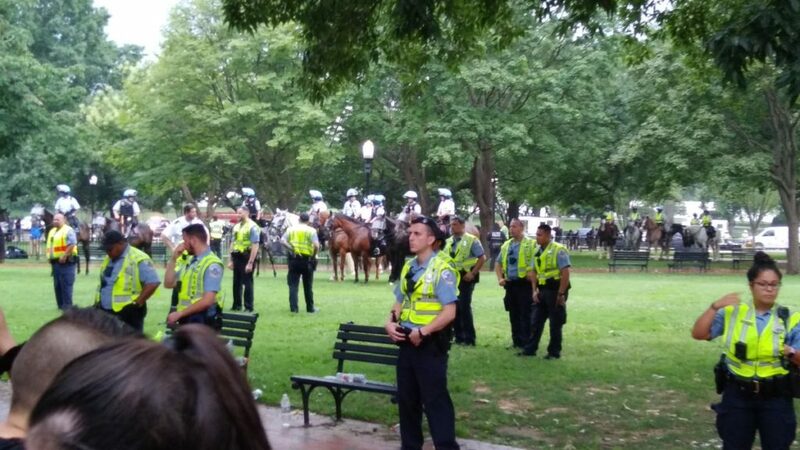 Much of the action at Saturday’s Unite the Right rally in Washington took place off the court, as social media users pushed messaging that the small turnout indicated that supremacist groups aren’t a problem (homeland security agencies disagree) or that counterprotest groups, including Black Lives Matter, constituted the real threat (there was no violence witnessed at the main protest). Organizer Jason Kessler told reporters that infighting between white nationalists and neo-Nazi groups led to a depressed turnout. He also said that security fears and fears of being “overly prosecuted” for tangling with counterprotesters also kept would-be protesters away, but Kessler was involved with the planning of the event and could have relayed to interested parties that there would be a designated Metro car, riot police at the Metro station, and a large buffer between the two groups at Lafayette Square, which was not breached during the rally. Kessler, in his National Park Service application, believed at one time that up to 400 people were going to show up. 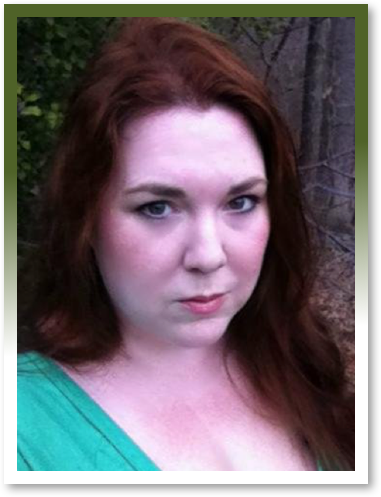 After the Charlottesville rally, social media awareness – sharing of photos and video stills, seeking information – and dedicated researchers diligently outed many of the participants. Just last month, ProPublica revealed that Michael Miselis, a clearance-holding aerospace engineer employed by Northrop Grumann, was captured on film punching an African-American counterprotester in Charlottesville a year ago. Miselis, who “is no longer an employee of Northrop Grumman” since the report, was identified as belonging to the Rise Above Movement, a Southern California white supremacist group that targets “destructive cultural influences” of liberals, Jews, Muslims and non-white immigrants. 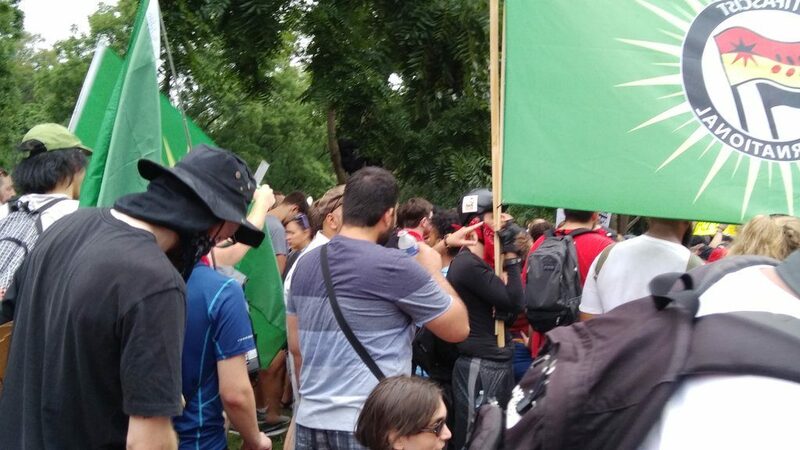 In Kessler’s instructions before the rally, participants were advised to not talk at all with the media; media ended up outnumbering Unite the Right participants. The counterprotesters were a large, demographically diverse group whose signs and flags indicated that they represented a swath of political aims (with messaging directed at the current administration), civil rights aims (including broader advocacy on policy issues such as immigration), and just general community unease with white nationalists coming into their city. 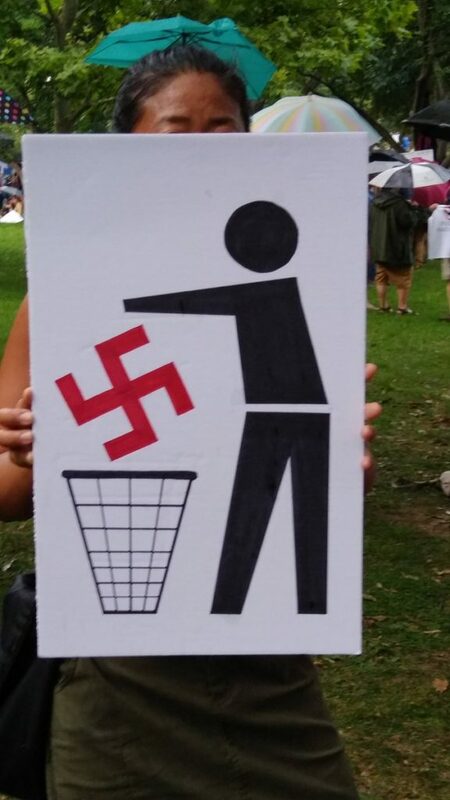 Many of the signs, naturally, decried Nazism and white supremacy. There was a noticeable contingent of representatives from Jewish congregations and organizations, as reflected by their signs. 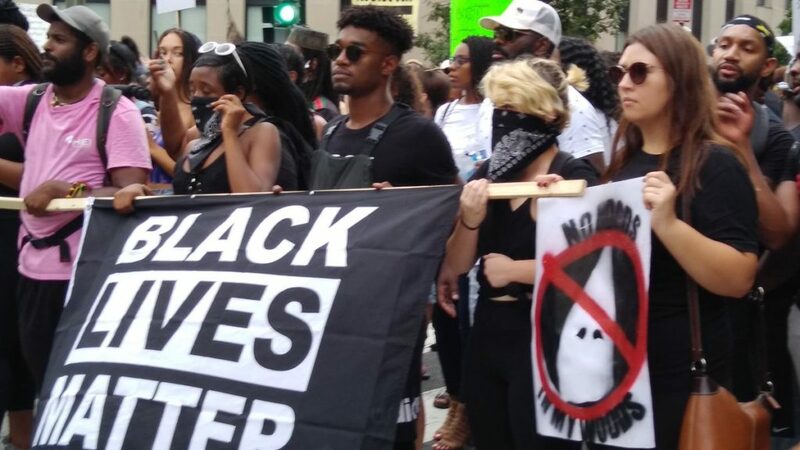 Black Lives Matter organizers declared on a blocked-off street behind the park that they weren’t going to confront the white nationalists but instead focus on a block party that celebrated African-American culture. Within the crowd at Lafayette Square, there were few anarchist “Antifa” members. A handful stood with Antifa International flags, and occasionally chanted a singsong “Jayyy-son” toward Kessler. Another small group of helmeted Antifa moved through the crowd together to different points of the police barricade, yet no other action was witnessed. Kessler’s rally was predictably much shorter than anticipated, and as the crowd began to peel off and go home – the rain played no small part – an unseen person announced with a bullhorn that protesters were welcome to come join another group of protesters who were assembled a block away on 17th Street NW. 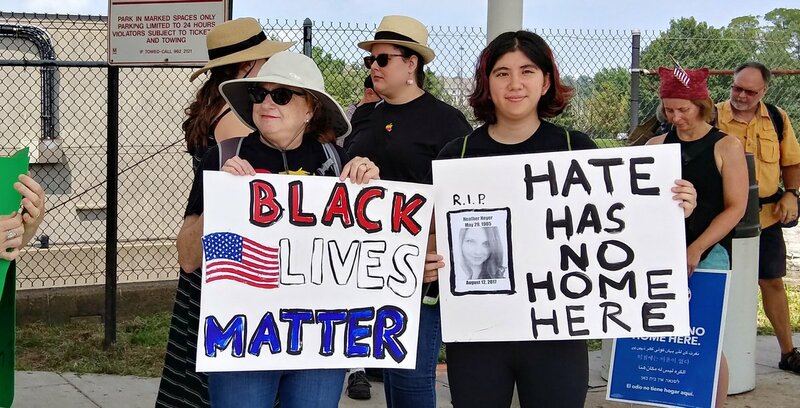 Though the message was difficult to hear, it sounded like they claimed the 17th Street group was being prevented by law enforcement from entering the main protest area. Marching a block to the intersection revealed a couple hundred or so anarchist protesters, who quickly began marching up 17th. Not all of the protesters who had come over from the park decided to stay for the Antifa event. There were some in this march carrying “Black Lives Matter” flags or chanting the same, but they appeared to be a different group than those at the earlier block party and main protest. They were dressed in black along with the other anarchist protesters, with rags to cover their faces if needed, indicating some crossover in activism but not formal association between the two groups that are already loose collectives. The Antifa medic team was ready, indicating this was not a spontaneous post-game protest. D.C. police let Antifa march largely unencumbered as they proceeded from areas blocked off by cops to active streets, which was easy to do with light Sunday evening traffic. At one point they ran among cars stopped for the marchers. At one point I was filming the marchers; one masked anarchist eventually came over and covered the lens of my cell phone camera with his hand without touching the phone, telling me that I shouldn’t be filming them. Another member chimed in, “If you support us, don’t film us.” I was not wearing my media credentials at the time, and no Antifa were hostile to me throughout the duration of the march. I continued filming when clashes occurred later. anarchists quickly broke it up, with one yelling “family” at the warring members and another reminding them that infighting hurt their cause. Antifa is treated by some in the media as a new creation in reaction to the Trump presidency, but these are basically the same anarchists who have protested at all political conventions – I covered their confrontations with police at the 2008 Democratic National Convention in Denver, and got a blast of pepper spray in the process – and global financial or political meetings, with a freshly added purpose to confront right-wing extremism with militant tactics. With the white nationalists gone for the day, the Antifa chants and aggressive tactics were focused against law enforcement, a traditional foe for the loose collective. 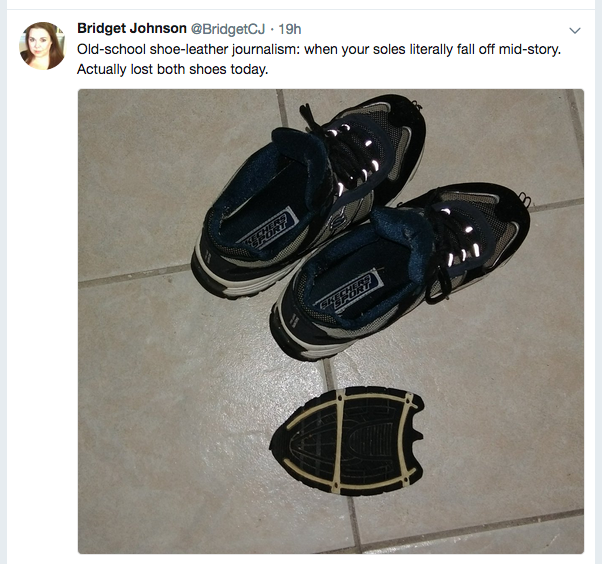 Bridget Johnson is the Managing Editor of Homeland Security Today, a Senior Risk Analyst with Gate 15and a veteran journalistwhose news articles and analyses have run in dozens of news outlets across the globe. Bridget first came to Washington to be online editor at The Hill, where she wrote The World from The Hill column on foreign policy. Previously she was an opinion writer and editorial board member at the Rocky Mountain News and nation/world news columnist at the Los Angeles Daily News.